Despite the positive impact energy policy has on the planet, it leaves some issues that must be immediately addressed. As of 2016, over 25% of Europe has quit coal-burning power stations, with plans to end the fossil fuel usage by 2020 in Austria and 2025 in Britain. Although the plant closures will have significant effects of lessening CO2 emissions, it leaves many countries wondering how they will fill the energy gap. According to a recent report by the Institution of Mechanical Engineers, Britain may face an energy gap of up to 55% at the end of a decade. Energy demand and efficiency must be considered now so that solutions can be developed prior to the total loss of the power grid. In other words, the UK (amongst other coal-reliant countries) soon faces an energy supply crisis, if they do not take the proper measures. One solution suggested to curb the loss of coal as a power source, is to tap into the potential of the electric vehicle market and how the switch can be reversed to power the grid. 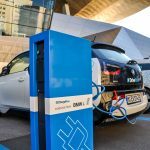 What is Vehicle to Grid Charging? Vehicle-to-grid (V2G) describes a system in which there is reciprocal, bi-directional electrical energy flow between plug-in electric vehicles, such as electric cars (BEV) and plug-in hybrids (PHEV), and the power grid. This is done through selling demand response services by throttling the charge rate or returning electricity to the grid. Studies show that most vehicles aren’t typically in use for up to 95% of the time so owning an electric vehicle is an untapped power source that many people have yet to explore. BEVs tend to have the highest capacity onboard storage system and when the grid requires energy, the power flows in the opposite direction to support things like peak hours or spinning reserves. Other types of V2G technology consists of load-sharing sources with the power grid. This can include subsets of V2G like vehicle-to-home (V2H) and vehicle-to-building (V2B), both of which draw power directly from the EV rather than through the power grid. According to a recent study by the National Grid and global engineering firm Ricardo, V2G could provide £600 to £8,000 of income each year for Britain’s electric vehicle owners. Energy stored in the vehicle can be used to avoid peak tariffs at times of demand and an extra strain on the power grid. V2G can also optimize the value of energy generated from home renewables (like solar panels) to reduce monthly bills. All of these cost savings are in addition to the savings bundled into owning an EV in the first place. According to the RAC Foundation, a 4kWh electric battery has the power to provide a third of the energy needs for a typical home in the UK. Products for home battery energy storage are currently being developed to offer the opportunity to scale-up dispersed energy storage capacity. Maximizing resource use through a fully connected home energy network can help homeowners save thousands on costs each year. Additionally, the energy can be saved from the power grid by using EVs when people are at work and running errands to power other buildings as part of a new grid infrastructure. V2G is intended to put more electric vehicles on the road in an attempt to give back to the power grid and save from any lapses in the power supply. Inevitably, this has an incredibly positive impact on the environment and the air. Not all vehicle owners have to invest in expensive technology, either. Hyperdrive Innovation’s battery energy storage systems (the intelligent Li-on battery) are helping make the V2G more accessible to consumers. These modular battery products are quickly being adopted by a variety of vehicle manufacturers. They can be used alongside stationary energy storage structures to work as a component of a smart home energy network. Whenever disruptive technology is introduced, there are always a few obstacles and learning curves to overcome. In order to use an electric vehicle to charge your home, you have to make sure you have a pretty strong charger nearby. As homeowners learn the best methods to employ V2G, they should be careful no the leave themselves without a vehicle by borrowing too much power from the car. Another obstacle V2G faces is the fact that when batteries are overused, they become less effective at storing energy. However, as the stronger lithium-ion batteries are getting cheaper to manufacture (and more disposable), this issue is quickly becoming less of a problem. Business cases for V2G still need to be made in a variety of local economies and governments. In the UK, domestic-based charging applications can become an obstacle. Fuel cell technologies company Cenex is leading a project to begin integrating V2G into the existing energy infrastructure in cities like Berlin, Valencia, and Birmingham. V2G is fairly new but each year more car companies are jumping on board to harness the potential of the technology. This type of hardware helps to balance supply and demand when used in addition to smart chargers. Not all companies are building their own models. BMW and Honda are pairing with commercial partners and research development hubs to ensure the technology is in top shape when released. Tesla announced last September that they plan to release V2G “very, very soon” but are just making some final tweaks. In summary, although V2G is vital to close the energy gap in some countries, there are still quite a few issues to overcome before implementing the technology en masse. A commitment to developing a cleaner energy infrastructure, advances in research, and strong economic incentives for consumers are all benchmarks that must be in place for V2G to come to full fruition. A holistic and smart approach to EV use, storage, and energy generation will ensure that the supply and demand gap is filled before an energy crisis even forms on the horizon.